Synopsis : In the near future, the earth is no longer able to sustain humanity. Crops are routinely ravaged by blight, dust storms scour the land, and mankind has regressed to anagrarian society. Cooper, a former NASA test pilot and engineer turned farmer lives with his family, including his father-in-law Donald, son Tom, and ten-year-old daughter Murphy, who believes their house is haunted by a ghost that is trying to communicate to her. Challenging Murph to prove the ghost's existence through scientific inquiry, Cooper discovers that the "ghost" is an unknown form of intelligence sending them coded messages by means of gravitational anomaly altering the dust on the floor in a pattern that resembles morse code, directing them to a secret NASA installation led by Professor Brand. Brand reveals to Cooper that a wormhole has been discovered in the solar system orbiting Saturn, and that humanity's only chance for survival is to traverse through the wormhole to colonise new worlds in another galaxy. NASA scientists believe that extra-dimensional beings are communicating with them and have provided the wormhole for humanity's use. Cooper is recruited to pilot Endurance, an experimental spacecraft, to follow the Lazarus Mission, a series of manned capsules sent through the wormhole to survey a dozen potential planets' long-term sustainability. The data from Lazarus has given NASA three potential habitable planets: Miller, Edmunds, and Mann, named after the astronauts who carried out the surveys. Once their viability is confirmed, humanity will follow aboard the NASA facility, which is an enormous space station. 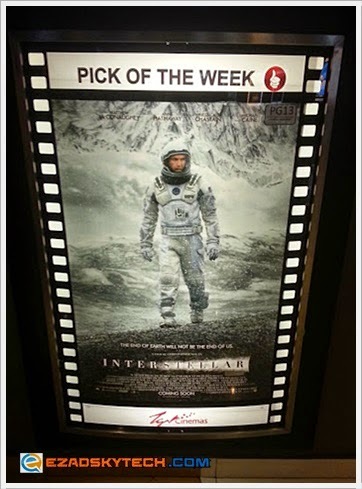 Haa, sebelum terus skip ke review movie ni...apa kata jom layan dulu trailer movie Interstellar ni dulu...roll VT !! 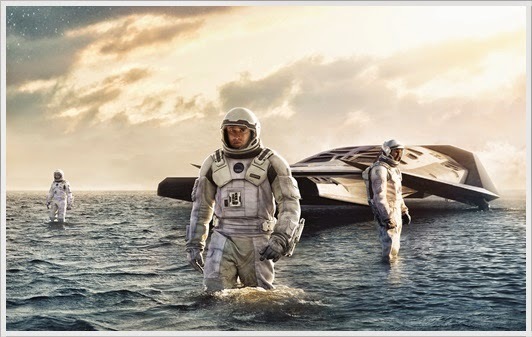 Kenapa perlu menonton Interstellar ? Cooper, Brand, Doyle dan Romilly telah mendarat di sebuah galaksi asing dan mengikut kajian jika sejam mereka berada di situ ianya bersamaan 7 tahun di Bumi...hanya Romilly yang tinggal di Endurance dan selebihnya mendarat di galaksi tersebut...apa tujuannya mereka ke situ agaknya ya ? Dapatkah mereka semua pulang semula ke Endurance dengan selamat ? Betul, movie sci-fic terbaik tahun ni. Tak expect bab ending movie ni.